What you see above is the story that went screaming out on the SI Wire at SI.com earlier today. Technically, it's true: Nick Saban is indeed visiting Texas this weekend—but only because Alabama's showdown with Texas A&M is still scheduled for Saturday in College Station. 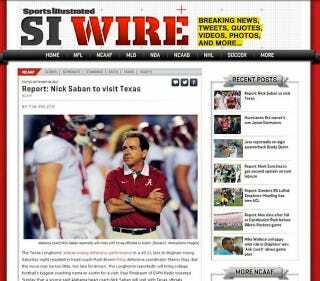 But that's not all SI.com is telling you here: The story says Saban is visiting Texas to talk to the Longhorns about the possibility of replacing Mack Brown, an especially unlikely scenario, given the timing. And right there in the first paragraph, SI.com attributes this "report" to a Paul Finebaum tweet. A tweet that was obviously satirical. Troll Tide! The Roll Bama Roll post also gained serious steam. Around 11 a.m. today, the site tweeted that it got more than 300,000 page views since going live. That original post has since been updated with three disclaimers—including one in the headline—to make it clear it was a joke. But the damage had already been done. SI.com has since it deleted its story. This is what can happen when people take Paul Finebaum seriously.